HIV is primarily transmitted to women via the cervicovaginal mucosa, with the infection remaining localized for several days prior to systemic dissemination and irreversible damage to the immune system. The early phase during which HIV infection is localized and exhibits little or no viral diversity presents a vantage point for HIV vaccines that stimulate T-cell mediated clearance. CD8+ resident memory T-cells (TRM) are positioned at mucosal entry sites and are established upon resolution of infection by mucosal pathogens. TRM cells are long-lived and locally patrol mucosal tissues. Upon antigenic reactivation, the sentinel-like functions of TRM cells mediate rapid clearance of subsequent infection by recruitment of additional immune cells from circulation and initiate a tissue-wide antiviral state, thus preventing the recurrence of disease. These properties are ideally suited for an HIV vaccine aimed at halting the infection cycle of HIV during the earliest phases. 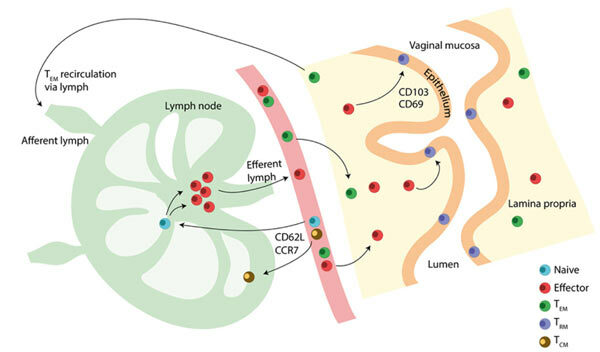 In this review, we summarize recent vaccine developments from parallel research areas incorporating the use of live mucosal vectors complemented with chemokine-regulating compounds, which can induce the seeding of the vaginal mucosa with TRM cells. We present the proposition that similar novel vaccine regimens can be translated into approaches for future HIV vaccines aimed at inducing heightened immunity in vaginal tissues against HIV. CTL, HIV, Mucosal immunity, Prime-pull, T-cells, Tissue resident, Vaccine, Vaginal mucosa. Department of Microbiology and Immunology, Peter Doherty Institute for Infection and Immunity at The University of Melbourne, 792 Elizabeth Street, Melbourne 3000, Victoria Australia.